I cannot believe the time has finally come to share my full living room reveal with you all. Let me tell you, this has been a long time coming, and I am thrilled to finally have it all finished. I cant tell you how many times items turned up broken, the wrong color, or just ended up not being what I was looking for. There was and still is so much to learn about interior decorating, but it was something I realized I loved and had such a passion for. 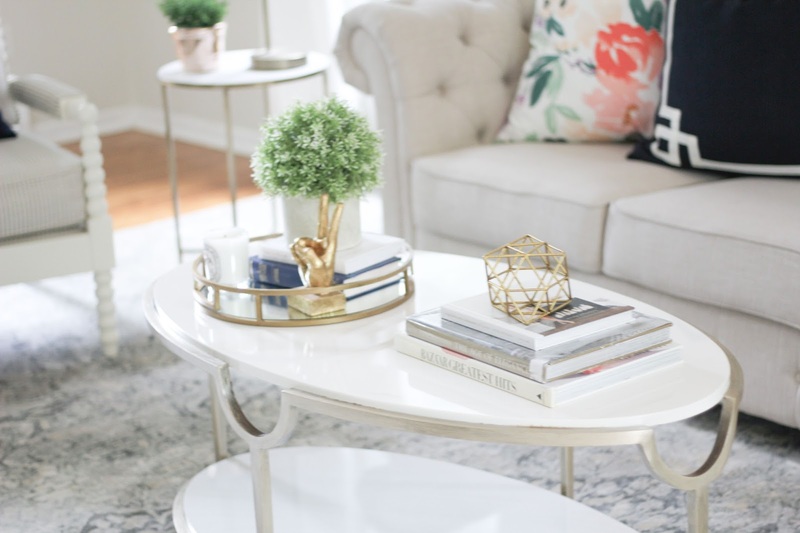 Here are my biggest tips for anyone wanting to redecorate their home. I honestly wish someone had written these all down for me before I began, because it would have saved me A LOT of time! 1. When you choose your main sofa, make sure and think about whether it will work as the CENTER of the room. Okay, this sounds like a no brainer, but its honestly something that ended up driving me bonkers towards the end. 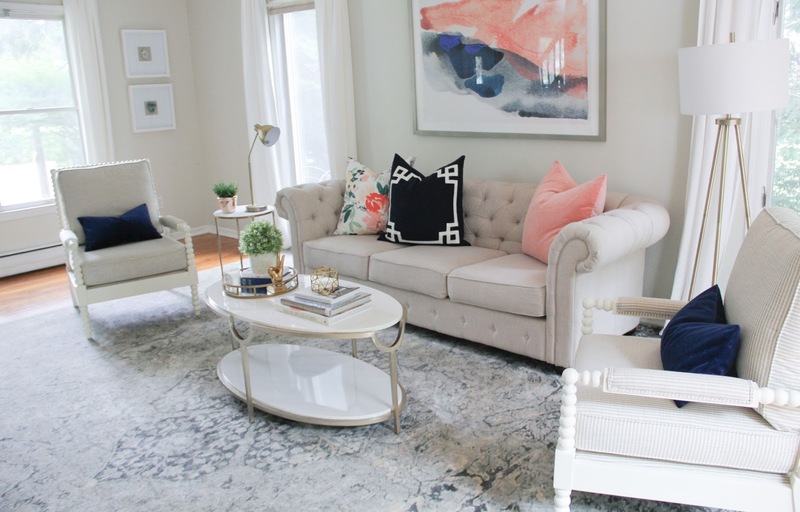 Our biggest issue was the second couch/loveseat we were wanting to do (instead of placing the spool arm chairs on each side of the main tufted sofa). I never realized how much went into choosing a second sofa. 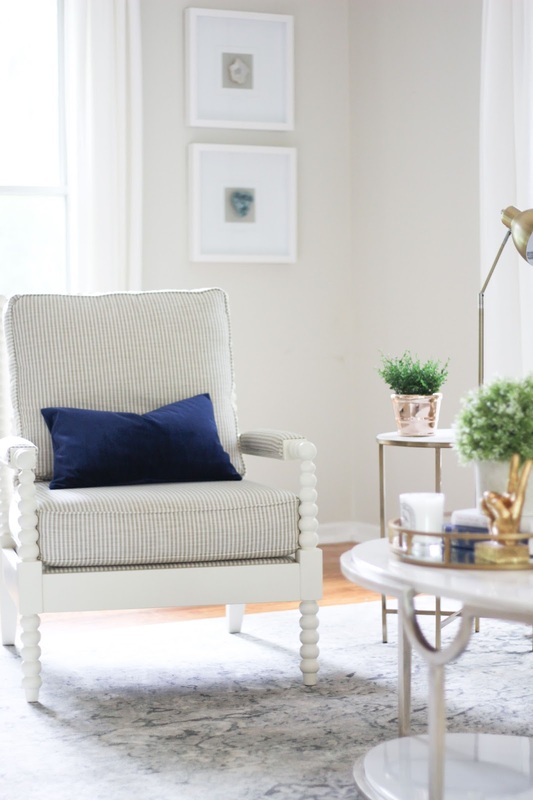 We originally wanted to do leather, because having another oatmeal colored sofa would be too much work keeping clean; but the color we wanted would throw off the balance of the room unless it was front and center. We tried moving the tufted sofa to the side, and doing a leather sofa in the middle, but that didn’t work at all. So, after weeks and weeks of searching and ultimately having to return two sofas; I decided to ditch the idea altogether until further notice. I placed our adorable side chairs on each side of the main sofa, and placed lumbar pillows on each to tie it all together. We are definitely going to add another couch in the living room for added seating, but for now this works. 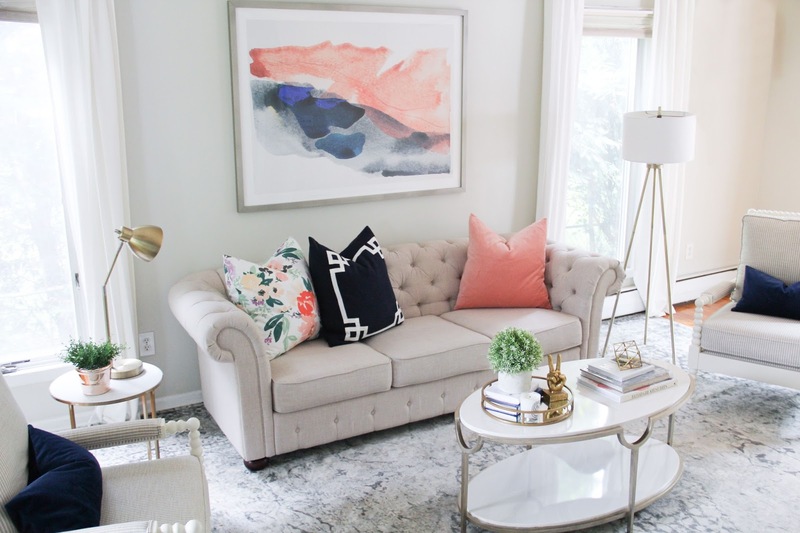 So, no matter how much you love a certain sofa, make sure you can pair it with a loveseat or second sofa without completely throwing off the balance of the room. 2. Now this one was HUGE for me. 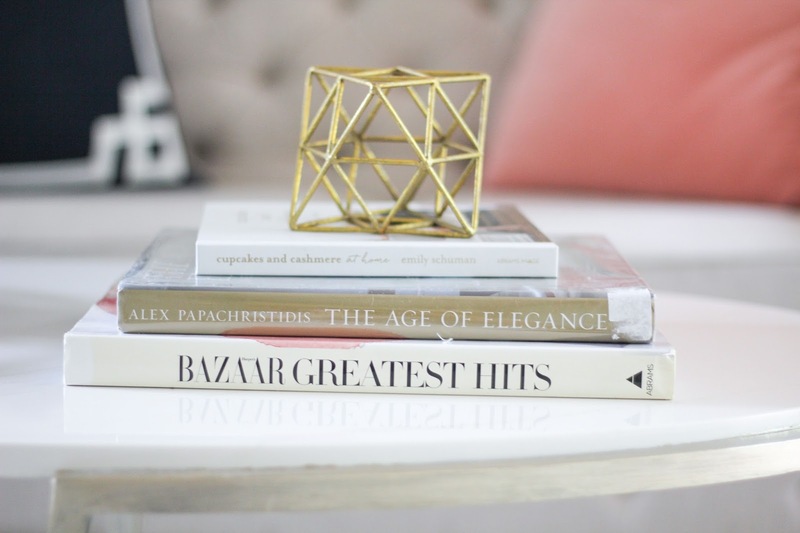 Make sure you have someone with a lot of knowledge of interior design to throw ideas off with. My best friend Kristen was such a huge help with this. She’d send me ideas, and id send her mine. She was honest when she didn’t like certain things, but also got my brain working which inspired me with new ideas that we both loved. Together we bounced ideas back and forth, which ultimately led to this living room which I am so proud of. 3. Measure, measure, MEASURE!! Also, a no brainer. Sometimes id see a certain furniture item, and my eyes would turn to hearts, and id hurry to put it into my cart because for some reason I thought everyone in the world was trying to purchase that exact item at the same time! Does anyone else do this? Well, STOP! Just stop. Take a deep breath, it’ll probably still be there in 20 minutes. Measure your areas. Make sure you get the right size, make sure it will fit and that it is still functional. I measured and taped out where our rug would be, the sofa, the painting, EVERYTHING. It really makes such a huge difference. 4. Order Samples! If there is one thing i’ve learned, colors always look a lot different in person. If you are buying furniture, do not purchase it unless they offer free color swatches . I ordered a hazy blue sofa online; in the images it was a really soft blue/grey, but in person it was a bright robins egg blue. Not what I was looking for, and it took four weeks to arrive. Just not worth it, order swatches! 6. Order BEFORE you move in. 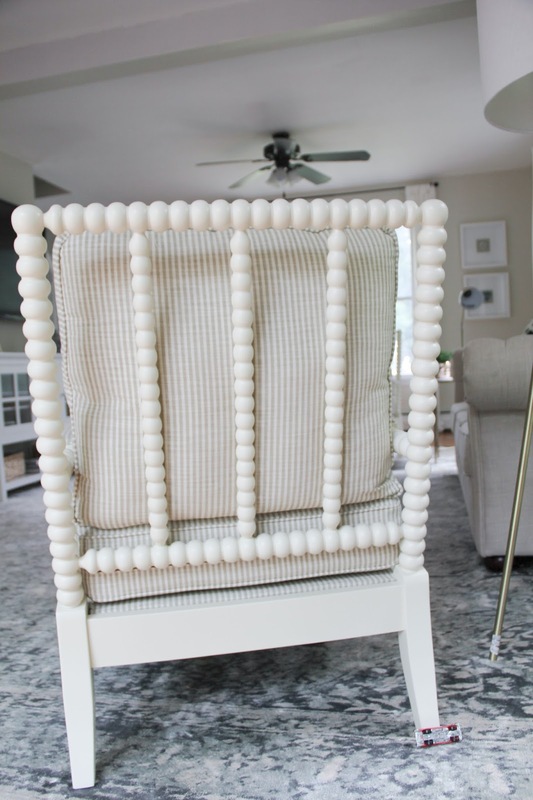 If you are moving into a new home, keep in mind that good furniture can take up to 8-10 weeks to arrive, especially if it is custom upholstered. This is the main reason our living room reveal took so long. 7. Think about the home as a whole, not room to room. When a home doesn’t flow from room to room, it can be a little overwhelming and make the home look a little unorganized. I learned that sticking to the same color theme in each room would make our home look a lot nicer, and flow a lot better. 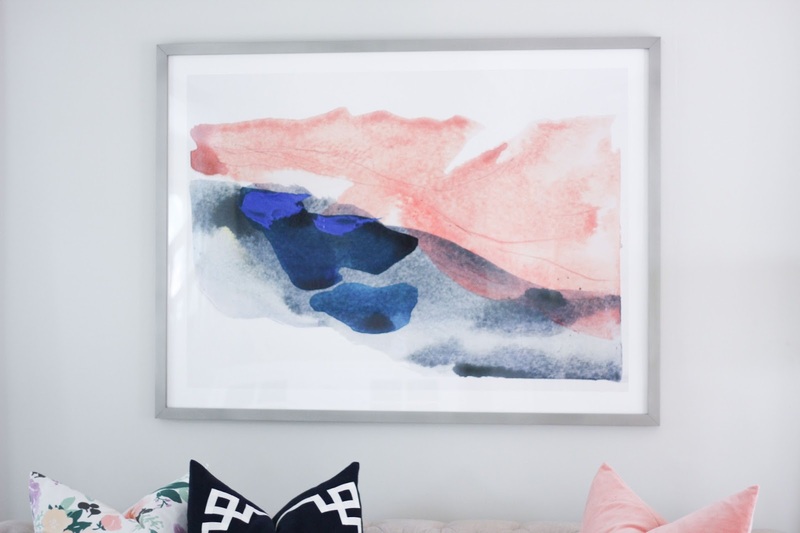 This gorgeous painting from Minted was the perfect main focus for our living room. It is bright, but subtle enough I can play with colors and textures and not have to worry about clashing. 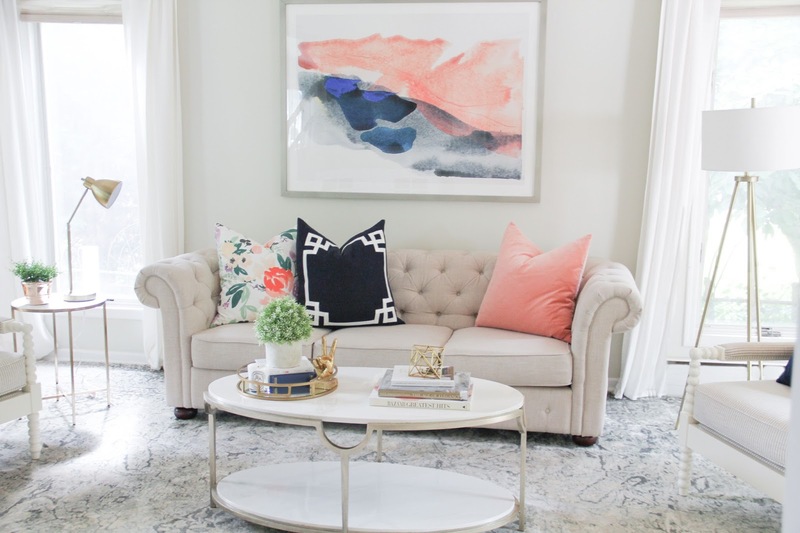 I love the soft peachy pink color, giving it a nice feminine touch without going overboard. The bold navy brings some masculinity to the area, and together its just beautiful. I ordered the 54×40 with a metal frame because as the center of the room; I wanted it to have a large presence. If you are wanting something smaller as an accent painting, they also have tons of smaller sizes as well. 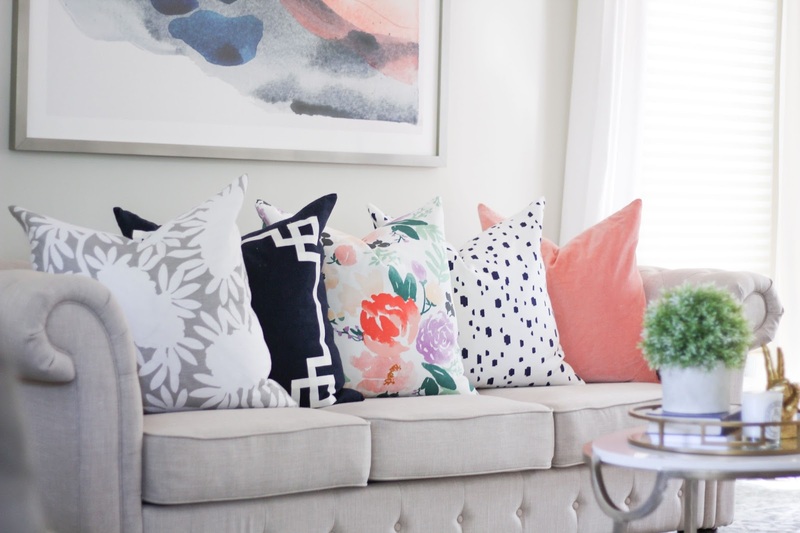 It pairs perfectly with these gorgeous Caitlin Wilson Textiles pillow covers that I still cannot get enough of. 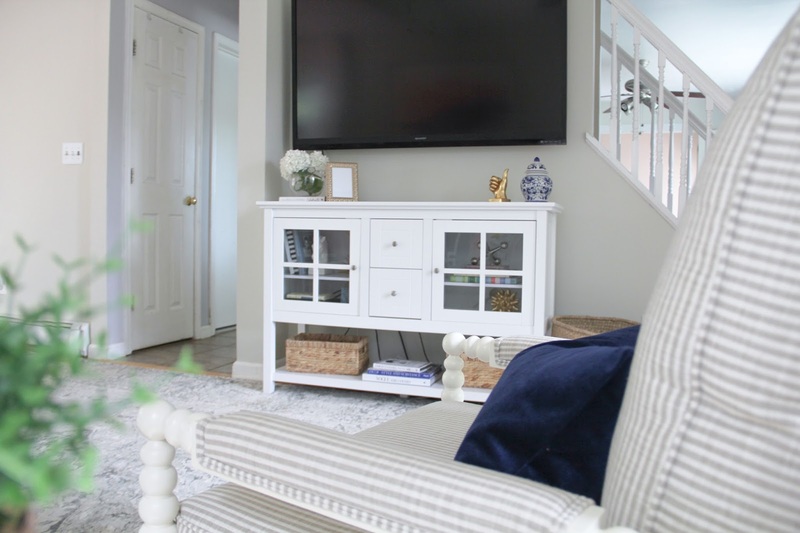 I hope you love this light and airy living space as much as I do, thanks for stopping by! Coffee Table: High Fashion Home c/o I used this paint to make the metal this gorgeous color, and a simple small paint brush. Very Easy. Oh my gosh I just love everything !!!! I would love my house to look like this!!! What a beautiful space! You did a great job– we are looking to move and thinking about decorating is so overwhelming. i love you simple but sometimes forgotten tips! thanks for sharing.